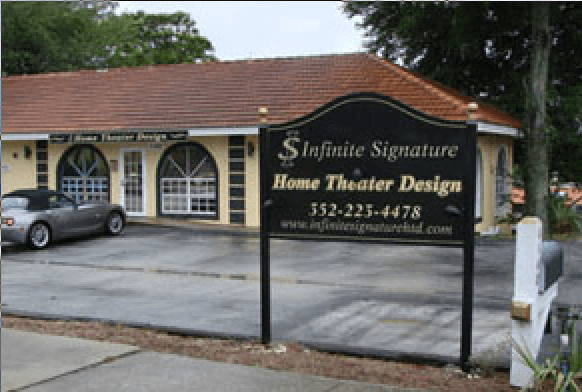 Infinite Signature Home Theatre Designs, Inc.
We began our theatre designs in the South Florida area and are now bringing our creative designs to Central Florida. Come see our spectacular show room in Clermont, but please call for an appoinment and we guarantee you will have an unforgetable experience. We are a one stop shop - from electronics, drapes, seating acoustic panels, you name it!!! We are pleased to announce that we have opened a wine room division. Please visit our gallery and click on the wine rooms tab to view our spectacular designs. Want one!? Give us a call at (352)223-4378.